Try These Great Closet Organizers! Home|Blog|Uncategorized|Try These Great Closet Organizers! Make the most of your Katahdin Cedar Log Home’s valuable storage space with these innovative closet organizers we saw at the 2018 International Builders’ Show. Servetto Clothes Lifts —These nifty hand-levered racks allow you to utilize the full height of your storage closets. The clothes rack is suspended between two folding arms that pull down with the handy attached rod and lift back into place. 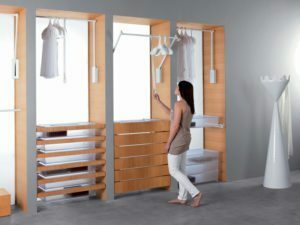 This closet organzier brings your shirts down to eye level for easy access, they fold up to stow the clothing up high. This allows for additional space for other closet built-ins racks and shelving. Their design, first patented in 1968, offers several designs with different technical specifications and load capacities. One of the most popular models is the 3T which features a soft close pull-down mechanism. Click here to see the different models available. Servetto is based in Italy but their website is available in English. The Revolving Shoe Cabinet by Velart is a virtual motorized shoe carousel to allow easy access to a large selection of footwear. The cabinet is available with a choice of doors: glass, solid wood, or leather inserts. The Revolving Shoe Cabinet fits standard closet dimensions, so it can be installed in existing cabinets. The standard cabinet measures 16 inches deep x 30 inches wide x 96 inches tall and may be customized to fit other specifications. Velart’s Revolving Shoe Cabinet is powered by a “plug and play” motor for easy installation and low maintenance. The closet organizer for footwear is operated by an electric switch or via a smart phone app that can interface with photos of shoes to offer a specific selection at the press of a button. The Revolving Shoe Cabinet will be available in Fall 2018 at an introductory price of $2,000 for the standard model. The company will also be introducing a revolving wine rack with similar features. Click here to see a brief video of the Revolving Shoe Cabinet.